Bring 3 1/2 cups of water to a boil in a large stock pot, and stir in the fresh clams. Allow them to cook for about 10 minutes or until they open. Remove them from the pot and reserve the water. Strain the water from the stock pot to remove any sand or particles the clams might have released. Save water as we will be using it to cook the rice shortly. Heat the achiote oil over a medium flame in another large pot or paella pan. When the oil is hot, add the red bell peppers (ajíes), onion and garlic. Sauté until the onion becomes translucent or soft. Finally, add can of clams with clam juice, and rice into the pan. Stir ingredients well. Now is the time to add 3 cups of the water you saved from boiling the clams. Season the rice with salt and pepper to taste, and allow it to cook for 15 minutes. Watch the rice carefully. When you see that the water has started to reside and the rice is beginning to dry, lower the flame and add the clams you cooked earlier. 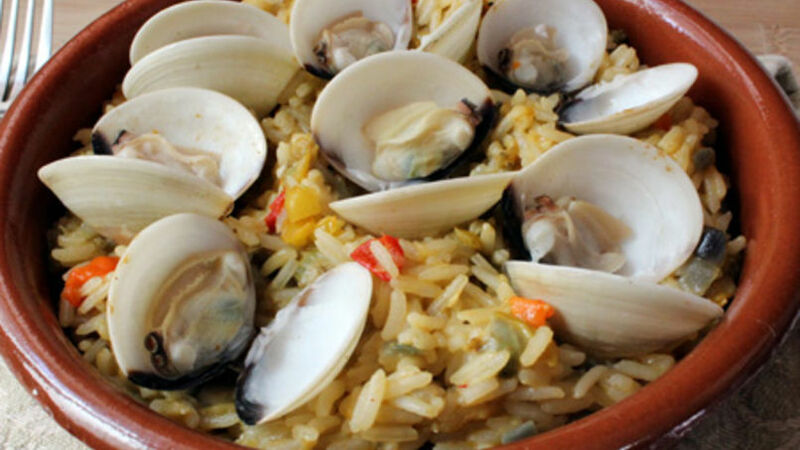 Cover the rice with the clams and allow the rice to finish cooking, approximately 20 minutes. Serve the rice and clams in their shells. You can substitute the achiote oil with 1/2 teaspoon of sazón seasoning or a powdered annatto seasoning. If you cannot find the Mexican ajíes, you can use another kind of sweet red or green pepper. Rice with Chipi Chipi is a well-known and loved dish from the Caribbean coast of Colombia. This region of the country has a particularly vibrant gastronomy, thanks to its glorious fusion of indigenous, European, African and mestizo cuisines! And if this weren’t enough, there is an abundance of rich food including fish, meat, vegetables and legumes in large supply. When I think of Rice with Chipi Chipi, I remember the warm beaches of the west coast of Puerto Rico, where I first tried it. Why not create your own memories of this classic dish with your family? It will be a memorable experience for everyone.